Sliding miter saws have been around for years, with a number of companies putting forth entries based on the same principle: the saw can slide forward and back on a pair of rails that protrude from the back of the saw. This design has a major drawback, in that there needs to be considerable clearance behind the saw to accommodate the rails. Bosch has come up with a revolutionary new design that eliminates this problem. Instead of sliding on two rails, the Bosch GCM12SD Sliding Miter Saw uses a pair of hinged arms that do not protrude out behind the saw. Simply put, this Bosch miter saw is a game changer. Equipped with an automatic electric brake, designed to stop the blade within 5 seconds or releasing the trigger. Miter capacity of 52 degrees left and 60 degrees right. Bevel capacity of 47 degrees left and 47 degrees right. The powerful 15-amp motor spins the 12-inch blade at 3800 RPM. 12-inch (60-tooth) blade, workpiece clamp, and dust bag included. I first learned about the Bosch GCM12SD Axial-Glide Miter Saw when I have treated to a visit to the testing lab at the Bosch facilities a couple of years ago. While there were a number of really cool innovations that I was able to check out, there was one prototype in the corner that caught my eye: a sliding miter saw that used no rails. Instead, this prototype sliding miter saw used two arms with sealed bearings at the joints, with one arm oriented horizontally and the other vertically. The result was the smoothest, most enjoyable experience I've ever had on a sliding miter saw. While the saw I was able to play with at that time was just a prototype, it was obvious just how truly amazing this innovation was. It took almost two years before this saw hit the market (with a number of features having been added since that prototype), but it was well worth the wait. While the incredibly smooth Axial-Glide sliding system is certainly the saw's calling card, the remainder of the feature set is nearly as impressive. 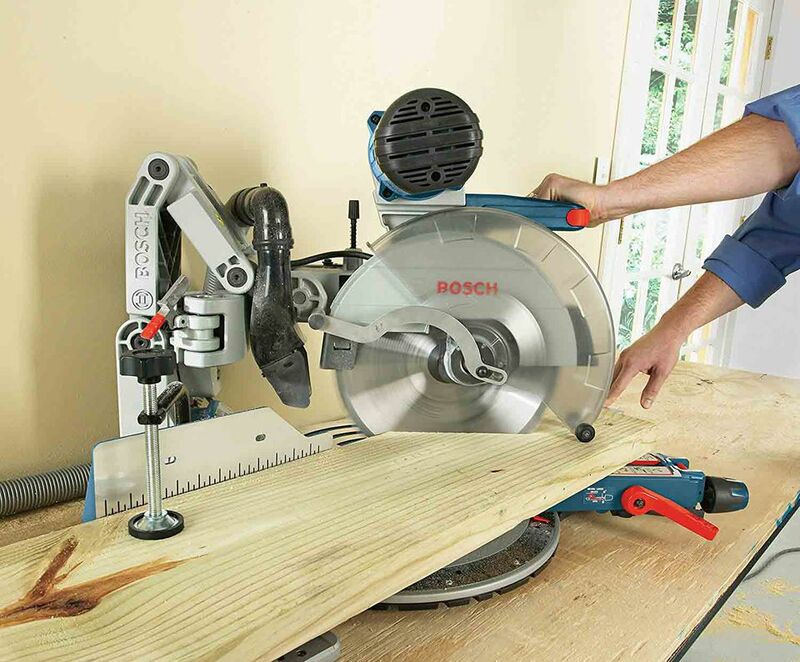 First, Bosch has positioned the miter and the bevel controls on the front of the saw. No more reaching behind to loosen a knob in order to adjust the bevel. Second, the saw comes equipped with a sliding stock support on each side of the table, giving the saw table the ability to easily support 40-inches of stock. Third, the saw has a 6-1/2 inch vertical baseboard or crown molding capacity, a horizontal capacity of 14 inches for baseboard or 10-1/2 inches for crown molding, and can cut up to 4-1/2 inch thick stock (14-inches wide) at 90-degrees or 2-3/4 inch stick (again, 14-inches wide) at 45-degrees. The saw has adjustable miter detents at 0, 15, 31.6, 22.5, 45 and 60 (right) and bevel detents at 0, 33.9 and 45 degrees (left or right). The Bosch GCM12SD miter saw weighs in at a surprisingly light 65 pounds, and is equipped with a carrying handle on each side of the saw, in addition to a top carrying handle and ambidextrous trigger. While there is some assembly required straight out of the box, it really amounts to little more than installing the miter lock knob and bevel lock lever to the front of the saw, a task that takes about two minutes. The operating manual is exceptionally well-written and includes sections on cutting grooves (using the depth stop), baseboard and even crown molding. One final item that I'll mention: when I was discussing this saw with the Bosch engineers, they told me that in field testing, some users actually complained that the sliding mechanism was TOO smooth. As a result, they added the ability to add tension to the glide movement controller using the onboard wrench. A subtle feature, but one that put a nice finishing touch on an incredible tool.